I made this cake way back in the first week of March and I’ve been thinking about it ever since. We were invited to a friend’s house for dinner and I said I’d bring dessert. 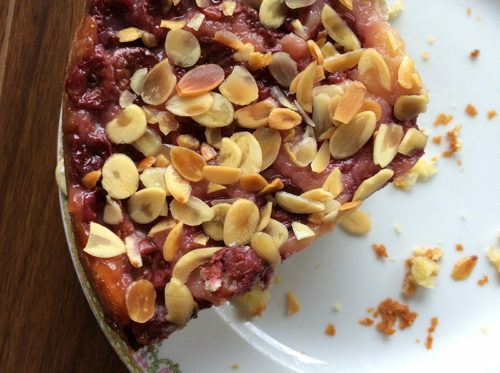 I wasn’t sure exactly what I’d make but this recipe called out to me with it’s almond-y goodness and my love of sour cherries sealed the deal. It’s a very good cake. And it’s pretty easy to whip up on a sunny afternoon. And as you can see from the photos, it’s also easily transportable by bike as long as you’ve got a nice basket set up and a cute vintage cake tin! Now the weather is sunnier and warmer and more frequent bike rides with stops on sunny patios are calling my name. Last month I spent a week in sunny LA and have been living on the tropical bougainvillea fumes ever since. I can’t really complain though because ever since we’ve returned to Vancouver, we’ve been given an early summer with sandals, picnics in parks and balcony layouts. It’s a nice breather because in June I’m scheduled for foot surgery (arthritis in both my big toes) and I’m pretty scared about it all. My only surgery experience involved tonsils and I was in kindergarten at the time, so it’s kind of a big deal. Also the fact that I’ll need another surgery on my other foot when this one heals up isn’t exactly Netflix and chill time. I guess it’s good that I’ve been attending Sunday afternoon yoga classes at a local studio to help ease my mind and body. Oh yeah, and there’s cake. Let’s never forget about cake. I should also let you all know that I’ll be at the always awesome Got Craft? market this May 7 + 8. Say hello, wish me a happy birthday on the Sunday and stay for all the amazing local crafters! I’ll be selling my cards and there will be tons of amazing talent and lots of local yummy food vendors too! I used sour cherries that I had frozen from last summer, but I think most any fruit would work here – strawberries, raspberries, peaches, nectarines, blackberries or blueberries would all be fine choices. Now that rhubarb is in the market, lay some length-wise sliced stalks in a lovely pattern on the bottom of the cake pan. Now that would be delicious! I don’t have a spring-form cake pan but if you do have one at your disposal, please use that instead as it prevents the double flip at the end of the recipe. Just un-collar the pan and you’re ready to let the cake cool. Preheat oven to 350F. Butter a 9″ cake pan. Cut a circle of parchment paper to fit into the bottom of the pan and butter that. Dust the pan with flour, tapping out any excess. Add the cherries (frozen is fine) to the bottom of the cake pan in an even layer. Sprinkle with 2 tablespoons of sugar. Whisk together the ap flour, almond flour, baking powder, salt and baking soda in a medium sized bowl. In a large bowl of an electric mixer, add in butter and sugar and beat together until fluffy. Add in the eggs, one at a time, mixing well after each addition. Add in the almond extract and lemon zest. Combine the milk and the yogurt together and set aside. Add in the flour and alternate with the yogurt mixture, until you’ve ended with the flour. Pour the batter over the cherries in the cake pan and smooth out the top. Bake for 1 hour and 20 minutes or until cake is golden brown and a cake tester inserted into the middle comes out clean. Remove from oven and let the cake cool on a baking rack for 15 minutes. 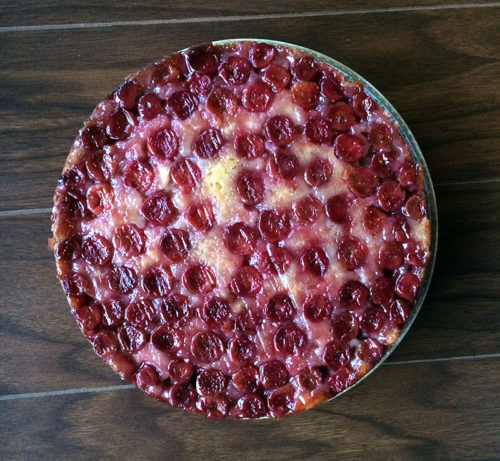 Run a knife around the sides of the cake pan and invert the cake onto the baking rack and then quickly invert again against your serving plate so that the cake rests on the bottom while the cherries are on top. 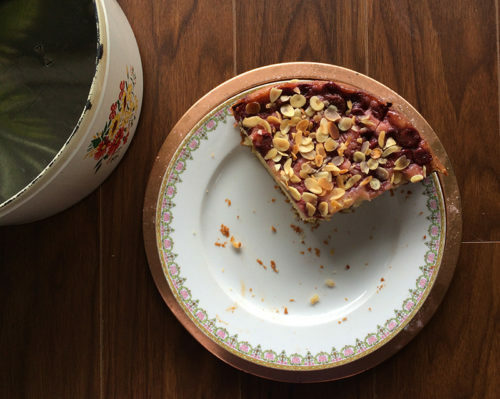 Let cake cool completely before dusting with powdered sugar and a sprinkle of toasted almonds. 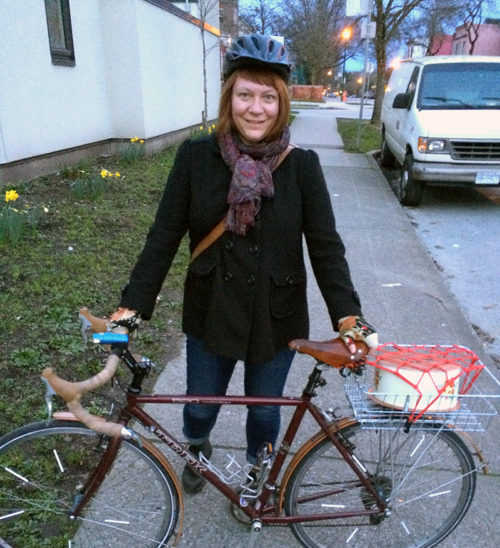 I am also a Vancouverite and have had two hip surgeries this year (the latest last week). You will be ok!! Stock your fridge with lots of yogurt and soup before hand. Billie, yes, I was wondering what I should have on hand post-surgery! Soup it is! Thanks for the reminder and I hope you recover quickly! Cairstine, yes, I love yogurt in baked goods too. I think rhubarb would be excellent! Let me know how it turns out! Good luck on the surgery, I know it seems scary but think how much better you’ll feel when it’s all done. This cake looks absolutely perfect! This cake looks amazing! It reminds me of the kind of cakes my grandmother made, always covered in toasted almonds. Yum! Good luck with surgery! You’ll do great! Best wishes for your surgery, Jeanette! I’ve never had surgery but am going to have to have it on at least one of my feet someday, so I understand your trepidation … but I’m sure it will be worth it. 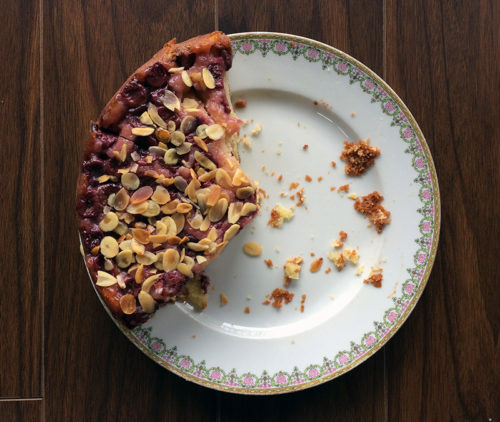 Meanwhile, cake, especially with cherries and almonds, must be one of the most soothing things. Thanks so much for sharing! Thanks Nicole! Yes, this cake looks nice and old-fashioned. Thanks Sherry, oh no, foot surgery for you too one day? Well, I’ll keep everyone posted on how it goes – yes, it will definitely be worth it, I’m sure. Hey! this cake looks amazing—I discovered it trying to find sour cherry recipes (and you have an abundance!) What’s your method for freezing sour cherries? This cake looks amazing! Just curious about the amount of sugar – a 1/4 cup doesn’t seem like a lot. Is this a typo or is the cake meant to be not so sweet? Jen, you’re right! Ooops! It should be 1 1/4 cup of sugar. Fixed the recipe. Thank you! Now I know what to do with the sour cherries in my freezer! Thanks for this! OMG! Thanks for sharing… Looks so yummy. Will have to try this when the kids come home from school! !